The above chart shows the probability of running out of funds in retirement for someone who retires with $1,000,000 in today’s dollar and draws $55,080 each year (ASFA Retirement Standard for a comfortable retirement for a couple), growing at 3% inflation. It is assumed the funds are invested in a “Balanced” strategy (like most default super funds) with an expected return of 8.5% after fees (which many would say is very bullish) and expected volatility of 13.8%pa (which is probably fair). These probabilities were calculated using monte carlo simulation. So despite an expected return (8.5%) that is much higher than the drawdown (~5.5%), the probability of portfolio failure (i.e. running out of funds) is surprisingly high. Drawing this amount each year, linked to inflation means that after 30 years there is a greater than one in three chance of running out of funds (~35%). Around a 15% chance (~one in six) of running out of money inside 20 years which is somewhat of a concern given that is roughly a 65 year old’s life expectancy. 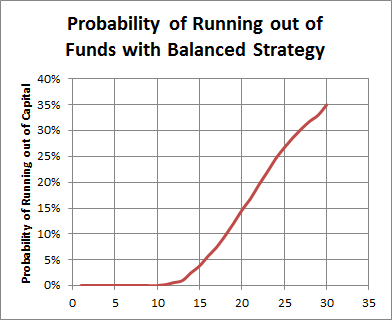 The main reason for this high chance of portfolio ruin is the sequencing risk a balanced strategy brings to the retiree. A portfolio which has around 70% invested in growth assets has a reasonably high probability of starting off with a sequence of poor returns (like we’ve seen over the past 5 years). When you throw in the required withdrawals to pay one’s lifestyle the chance of a portfolio recovering after a sequence of poor returns is quite low indeed. So what to do? Don’t put all retirement income at risk. Work out what the minimum required retirement income is to ensure a minimum lifestyle and lock it in with an inflation linked annuity or bond (if possible). I say inflation linked because inflation is another risk that cannot be removed with a portfolio of traditional portfolio of equities and bonds. There is no point putting one’s minimum lifestyle at risk so lock it in. Over and above that, there may be a need to chase return so that’s where the traditional portfolio of equities and bonds can come into play…surely a retiree would be less concerned about the risky portfolio if they know their basic costs are looked after. Whilst there much more to portfolio construction in retirement the above steps are certainly a step in the right direction from the current default superannuation fund solutions. This is all so very true with regards to the starting off point with a poor sequence of returns. And really, we have a huge influx of baby boomers entering retirement ie those born from 1945 onwards (the now 66 year olds and younger) seeking retirement income in one of the most uncertain market times in recent history. And your excellent message is slow to get through to the planning fraternity….because they have not been exposed to and are unaware of these probability numbers.